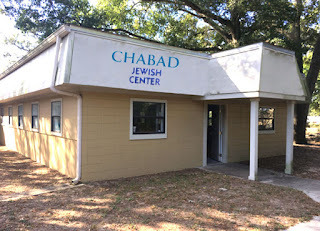 In 2014, Mississippi became the next-to-last state to have a Chabad presence. Now, just months after it was announced that South Dakota is making it 50-for-50, Chabad of South Mississippi announced its new Chabad House. “We’ve needed a new space for about a year,” Rabbi Akiva Hall said. “We’ve really outgrown our home,” where most of the Chabad activities have taken place. The new facility is a 2,000-square-foot building at 2030 Pass Road in Biloxi. The Halls also moved into a new home within walking distance of the new center. They initially raised $15,000 to get the project off the ground. On Feb. 8, they launched a 48-hour online fundraiser with a goal of $10,000; they concluded on Feb. 10 with $11,253. The building needs new floors and paint, Hall said, and they are putting in office space and a kitchen. A couple of divider walls will be built in the main room, to put in classrooms and an area for services or large events. Currently, Chabad offers services only on the holidays, as Hall said the educational and outreach programs are currently the priority. Hall hopes the building will be ready in time for Purim.